August 09, 2008 by A Knit Storm in "crafting with kids", "how-to"
Get ready for a fun and easy project to take on with a kid or two: the wonderful craft of finger knitting! 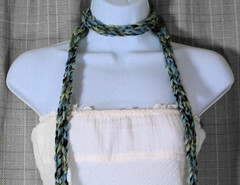 > Fun skinny scarves of many lengths, colors and styles. - Willing and able fingers! 1.) Take your yarn and weave it around the 4 fingers of your less dominant hand (i.e. if you're right handed, weave the yarn around the front and back of your left hand's fingers) minus your thumb. There should be yarn around the front and back of each of those 4 fingers. 2.) Now take the ball end of the yarn (part of the yarn that's connected to the ball of the yarn), and lay the yarn strand over the fingers that have the yarn weaved around them. 3.) Starting at one end of your fingers, pull the part of the yarn that's around your finger over the part that's laying on your hand, and to the back of the hand. The part that was laying on your hand will remain on that finger. Repeat this to the end of your fingers. 4.) Again lay a strand of the yarn over your hand and repeat the steps in #3 for every additional row. 5.) Continue with step 4 until you reach your desired length of finger knitting. Keep in mind that you should pull on the beginning of the work to determine how long the piece is as you're going, and continually do that to check on its length. 6.) When you've reached your desired length, simply bind off! All this involves is taking the loop that is around your pinky finger, transferring it so that it's around the ring finger, and passing the lower loop that's around the ring finger over this new loop. Then take the remaining loop on the ring finger, transfer it to the middle finger, pull the loop that's on the lower part of the middle finger over this new loop. See where this is going? Do the same thing with the last finger so that you have just one loop remaining on your index finger. Cut the yarn free from the ball, leaving a bit of a tail (a few inches long), and then just pull the tail through that remaining loop to secure your work. 7.) Your crochet hook comes in handy here because if you want to hide those end tails at the beginning and end of your work, you simply weave them into the stitches of your finger knitted piece with the crochet hook. 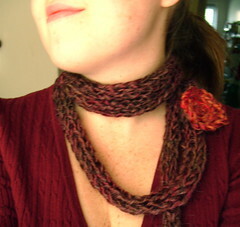 Or conversely you could leave them and tie extra bits of yarn on the ends for fringe if you prefer. I apologize for having to spell this out. I had originally taken video of how to do this but it would not import to my computer! If anyone has questions please leave them in the comments! Another great resource for finger knitting how-tos is youtube. Enjoy the fun and exciting world of finger knitting!